I’m running to catch the train this morning… again. I’m not usually prompt, my friends can surely attest to that. Growing up, I lived a quarter of a mile from my high school and yet I was late every single morning. I remember my locker being right outside the door to my first period class, frantically turning the lock to get my books before the second bell. My teacher would do this thing where she’d lock the door and make all the latecomers stand in the hallway until after she took attendance. Sorry teach, that never taught me anything. I’m still running late. I jumped on the 7:54am train today. The train operator saw me running and kindly opened the doors for me, a rarity. I’ll probably get into work right on time, around 8:30am… but also depending on if I grab a coffee or not… which I probably will. 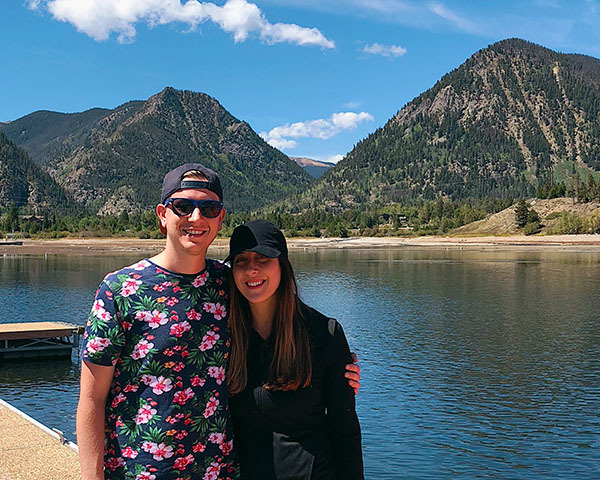 There was a running joke we had in college about someone who shows up late with an iced coffee in hand – it doesn’t look good but I don’t worry too much about it. I’ve been like this forever. I’ll look at the clock and say something like, “Great! I have fifteen minutes before I need to leave, plenty of time!” and next thing you know, like I’m in some kind of time vortex, I’m leaving five minutes after I should. It’s inevitable. Which leads me to this recipe. 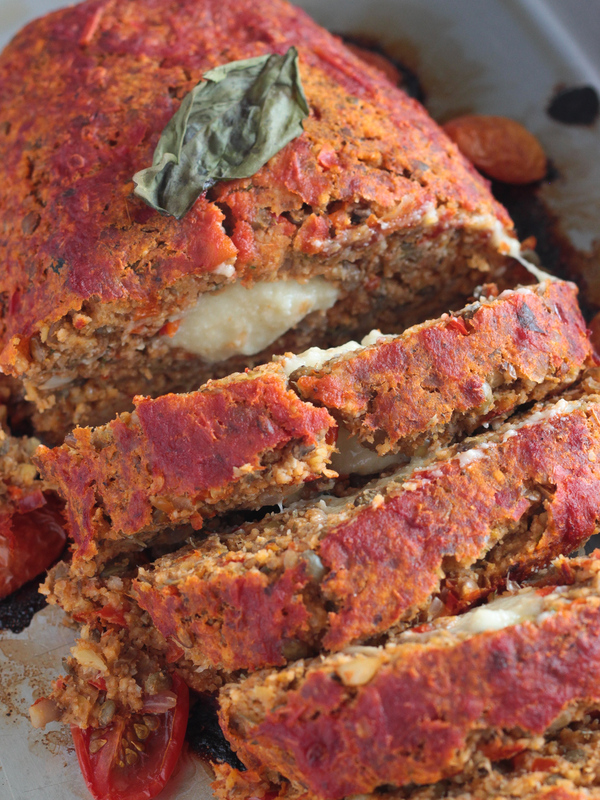 A homecooked vegan Italian meatloaf that brings me back to the good parts of my high school days. 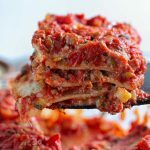 An Italian meatloaf cooked with mushy love and a cheesy center – then smothered in red sauce, of course. I really wanted to get this recipe right. To be honest, nothing can replicate fatty ground beef but that’s not what I was looking to do. I wanted to create something healthier but still hearty and flavorful. After much thought, I made this Vegan Italian Meatloaf with brown lentils for the bulk and mushrooms for the savoriness. Then I smushed some melty, stretchy vegan mozzarella cheese in the center before popping in the oven to get extra crispy around the edges. 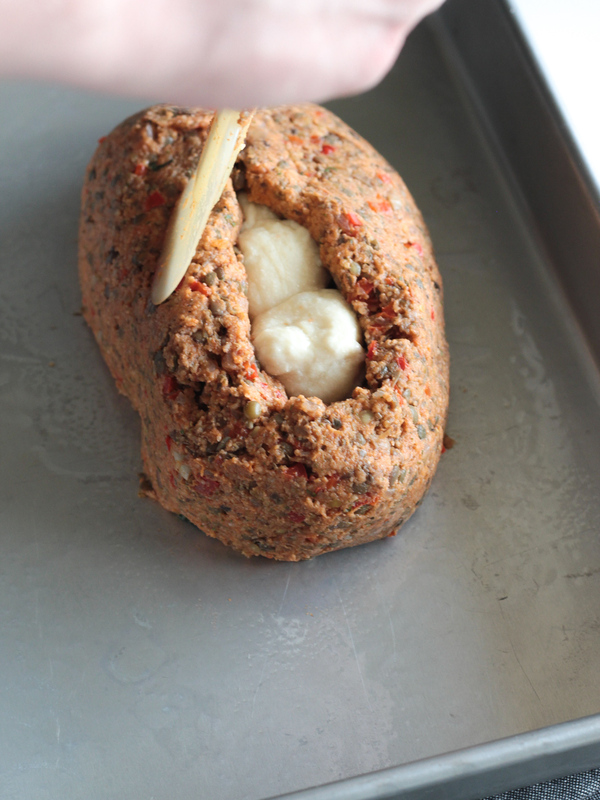 The result – an Italian meatloaf that smelled just like I remembered. 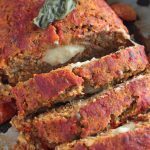 Traditional vegan Italian meatloaf made with mushrooms and lentils. 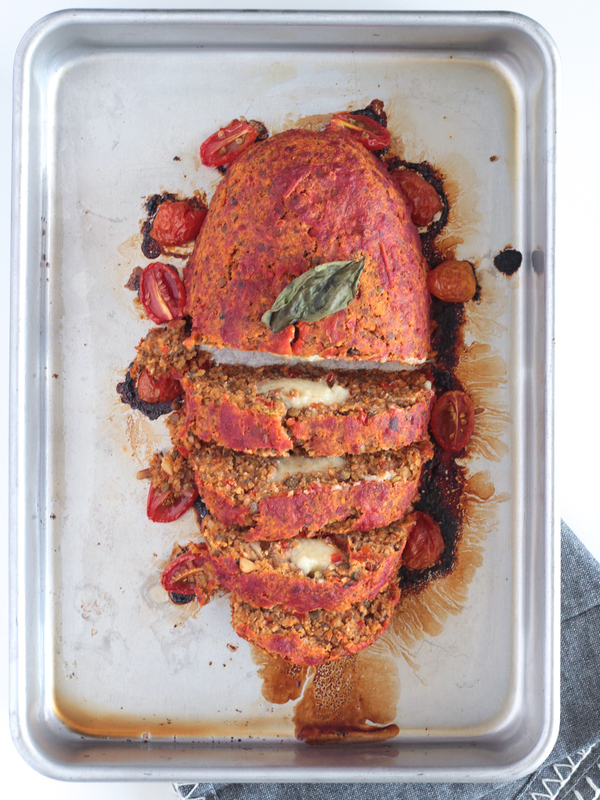 Stuffed with melty, stretchy vegan mozzarella and smothered in tomato sauce. Rinse 3/4 cup (135 g) dry green/brown lentils and place into a medium-sized pot with vegetable broth. Bring to a boil, reduce heat and cover. Simmer until double in size or the broth is mostly gone - about 20-25 minutes. Make sure to follow instructions on the package, as each brand may differ a little. You want them cooked but still on the firmer side. Drain remaining vegetable broth and let cool. Combine 1 tablespoon of ground flaxseed with 2.5 tablespoons water. Let sit to thicken for at least 10 minutes. Heat olive oil in a large skillet on medium-heat. Add chopped onion, mushrooms, basil; minced garlic; diced pepper and salt + pepper. Sauté until soft. Let cool. In a large bowl, measure out 1.5 cups (288 g) of cooked lentils. 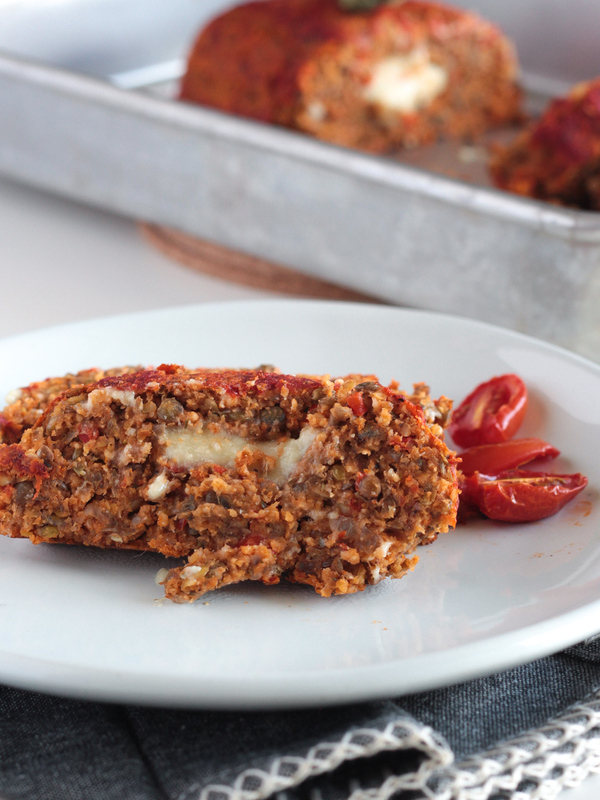 Add sautéed vegetables, flax egg, Italian seasoned breadcrumbs, and tomato sauce. Using a large spoon, mix until combined. Add 3/4 of the mixture into a food processor and process until all ingredients are combined. Add that back to the bowl with the unprocessed mixture and combine a last time. 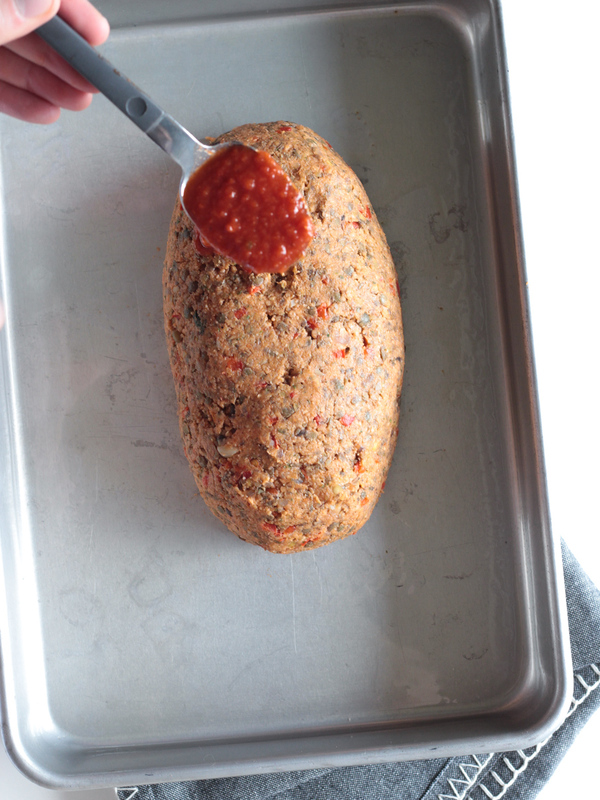 Pour mixture onto a well-greased baking sheet and use a spatula to shape into a loaf. Separate a well in the middle to add vegan mozzarella. Then, smooth the loaf mixture over the mozzarella so that it's not peeking through in any areas. Cover the top of the loaf with extra tomato sauce. Bake 45 minutes. IMPORTANT: Let sit for 10 minutes to cool slightly before slicing. This will allow the loaf to firm up a little bit so it's easier to cut. 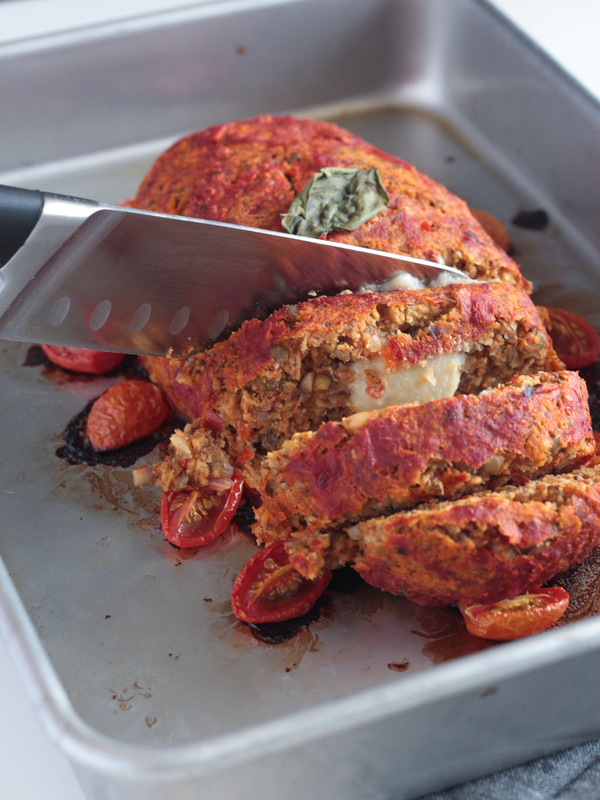 We baked our meatloaf uncovered for 45 minutes but feel free to experiment and bake longer if you'd like the outside edges to be a little more crispy. 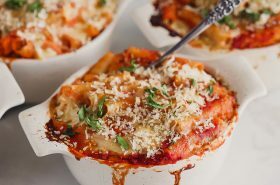 You can use your favorite tomato sauce for this recipe. Here's a tomato sauce recipe that we love. 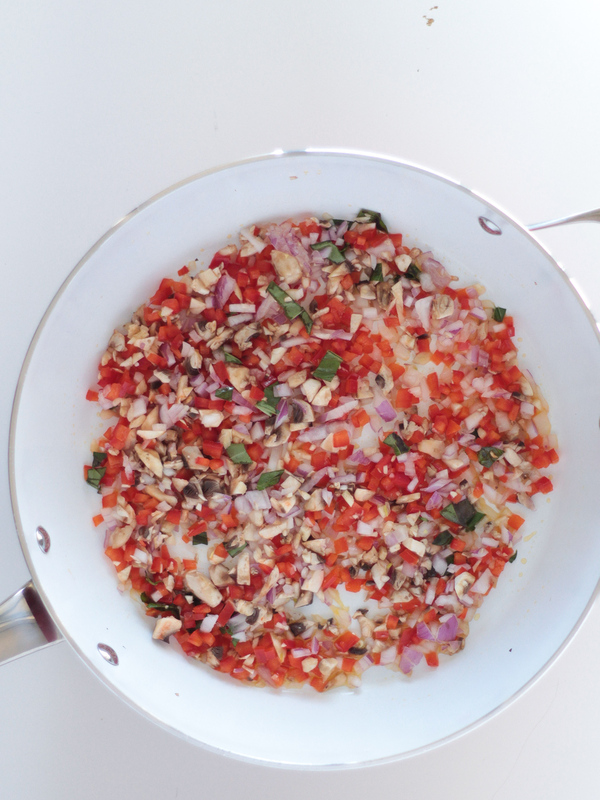 You can use any vegan mozzarella cheese you like but here's an easy one that we love! hahaha! You sound like me. I’ve been accused of doing it on purpose sometimes, but it’s just programmed into me to always just miss the train, the start of something, be five minutes late. And I don’t really care anymore because it’s not as if I’ll ever have my crap together. Anyway, I found you during an Instagram wormhole today and liked the site but forgot to take note of it (of course) but then randomly it popped up in my Pinterest feed too. So hopefully I’ll remember it now! 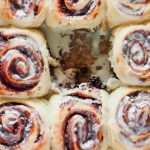 Gorgeous pictures and nice looking recipes! Oh my god! We had the same childhood. My dad took me to school late and my mom picked me up late. I’m still always running late. 🙂 sounds delicious I can’t wait to try it. Yes, they do expand quite a bit. Usually at least double in size, so 3/4 cup dry should get you at least 1.5 cups cooked. Enjoy! I’m not sure why that would happen. Did you use red lentils or gluten-free breadcrumbs? We’ve made this many times following this exact recipe and it’s always firm enough to cut once it cools for 10 minutes! The only other thing I can think of is the lentils were cooked too long possibly. Hi! I used green lentils and regular bread crumbs, but I do think the lentils may have cooked too long because some were slightly mushy. It firmed up rather nicely when it was cold after being in the fridge overnight and it was delicious sliced cold on sandwiches!! I’ll give it another go because the flavor is incredible! My non vegan hubby who doesn’t really care for lentils even liked it! Hi again! That’s great to hear! A shorter cook time on the lentils should greatly help the form. Fantastic! Was really craving some comfort food and this completely hit the spot! Thanks so much for the recipe! Hi, great website! I found you from Everything vegan FB group. Can’t wait to try some of your recipes! What kind of tomato sauce? Just a can of regular tomato sauce…. nothing fancy? Correct – any tomato sauce you prefer will work perfectly. 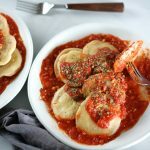 We have an easy recipe for marinara sauce on here as well you can check out if you’re interested. 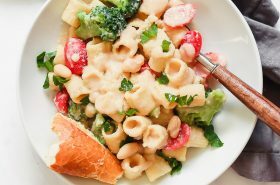 Also use Barilla Plus pasta to increase protein ! I’m really not sure about the TVP, as we have not experimented with it quite yet. 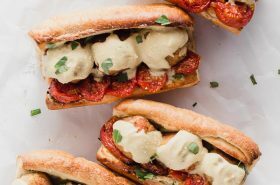 The loaf pan is a great idea and sandwiches or meatballs are also not discouraged 😉 Let us know if you try the TVP method, as we’d love to hear how it turns out! Oh,that sounds good! Will try making meatballs with this recipe! Thanks for the suggestion! Wow..,this was SO tasty!! I didn’t use “cheese” and I put it in a 9″ X 5″ loaf pan (well greased) because it didn’t look like it would hold together for a “freeform” loaf. 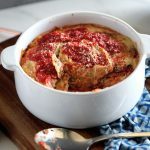 It tastes like my mother’s meatloaf (without the meat)…the texture is awesome,the flavor is so yummy…I’m going to make this for my next Grange meeting and see if the ladies can tell that it’s vegan!! Shhh! Don’t give it away! ? Hi, I’m wondering if you can substitute the flax seed with something else or where can I buy ground flaxseed from easily? Thanks, looking forward to cooking this with my mum! Thanks, Maria! So glad you loved it. 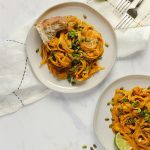 This is a tasty vegan recipe. I haven’t tried it but panko would probably work fine. Although, I would add a few more Italian seasonings to it such as garlic powder, onion powder, dried oregano and dried basil. Hi Sandra! I haven’t tried that before, the lentils give it that good mushy texture but smashed up chickpeas might work out just fine. You can always add a little more tomato sauce if it’s not holding together well enough. Would this be okay to make the night before and store it in the fridge? I can’t wait to try it, looks amazing! Definitely – let us know if you like it! 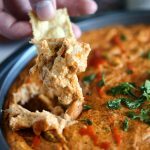 We LOVED this recipe and will definitely be making it again! It really firms up if you let it cool long enough (which was tough for us because it looks and smells SO GOOD). The flavor is incredible. We used the cheese recipe linked which was awesome too; we made it first and placed it in the fridge to cool completely which made it easier to stuff the loaf. HEAVEN! Thank you, Brittany! So glad you guys liked it! Hello! I made this on Sunday to take in my lunches this week… It smelled so good that my dad wanted to have some with our dinner. We loved it! My mom made a sandwich with it on Tuesday and she loved it, too. I used panko style Italian bread crumbs and some broken up vegan provolone slices. I took the last piece in my lunch today with some cous cous and kale I made with the left over veggies… I can’t wait to make another loaf and cruise through more of your recipes! Thank you! Happy to hear you liked the meatloaf, Sarah! It’s one of my favorite recipes on the blog. You might like our lentil meatballs or cauliflower walnut bolognese sauce, too. Cheers! Hi! Would GF breadcrumbs work in place of standard breadcrumbs ? If not then what else could I use as a binder ? Yes! GF breadcrumbs definitely work. Hi. Do you think this recipe would work if I didn’t use the cheese but I included rice?? Hi Sandy, you can definitely make the recipe without the cheese. I’m not sure if adding rice would turn out good though.